Hey, small tomato at the end! KETCH UP! The lighting in this shot is brilliant and the reflection in the worktop looks really good and the colours here really jump out at you and make you want to look. Feel free to contact me via the pm system if you have any questions about this critique. Congratulations on your top 20 finish. this is a really great entry. one of my favorites of the challenge. Wow--stunning photo. 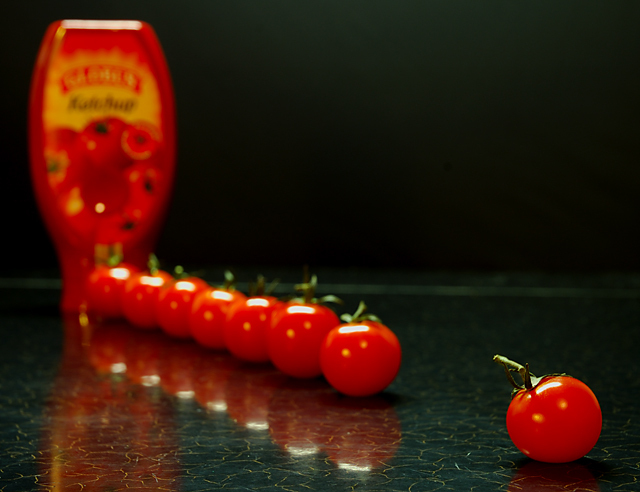 I particularly love the way the tomatoes reflect not only the light on their tops, but themselves below. Excellent work! nice shot, and a funny (however well-known) pun. This is realy good, and I even laughed, so well done.......I like the reflection. Mmmm, yum. Top ten at least! Nice one. Reminds me of Pulp Fiction. Groan.... are you from new Zealand btw? Proudly hosted by Sargasso Networks. Current Server Time: 04/18/2019 08:52:11 AM EDT.